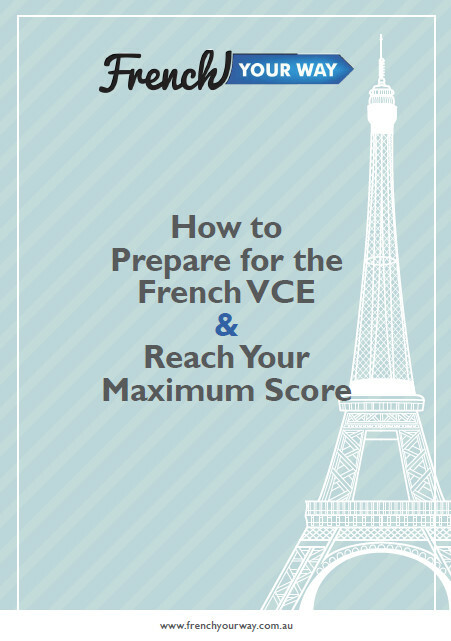 How to prepare for your French VCE? Actually, when you prepare for an exam (the French VCE exam or any exam), the first thing you should do is to get familiar with the exam requirements. You need to know the format of the exam and how you’re going to be assessed exactly. Unfortunately, I’ve noticed that many students do not know where to find that information, and are not always being given this information in the classroom. I know that the prospect of the exam may be very stressful, especially as you have a lot of homework in year 12, and many different subjects to study – not only French. So, the last year of high school can be particularly challenging, and you may also feel nervous at the thought of having to sit for an oral in French at the end of the year. I’ve put this guide together to help you prepare for your exam, so that you know where to find the useful information to prepare for your exam and how to use this information; where the official sources/resources are, and how you can get the most out of them so that you can learn how to shape your answers to meet the exam requirements. This is the number one thing to focus on. You will get my best tips on how to organise your vocabulary and grammar revisions throughout the year(s) leading to the exam, as well as how to prepare for each of the exam components (the listening, the reading, the writing and the oral). I also give you my tips on how to work on the typical mistakes students make and I’ve designed a worksheet on how to use your dictionary efficiently. All this because the exam is not only about your proficiency. It is also about methodology, structure and using the tools and information that are available to you. It was honestly very good! I think it will be a great tool for other students! My end of year result reflected the hard work that Jessica put in to me with a high score that I could have never expected without her. […] I strongly suggest French Your Way as it is the best education I have ever received in languages in the 6 years I have studied it! 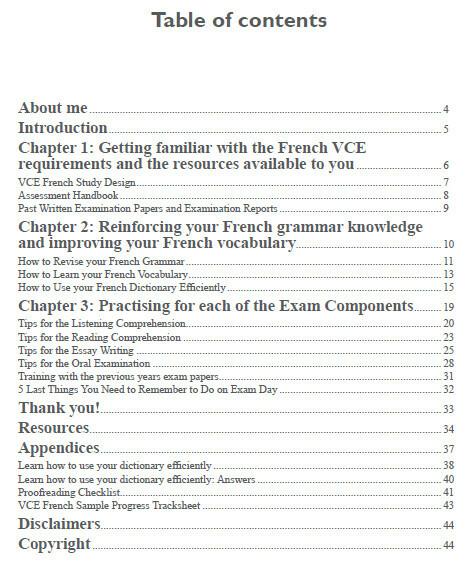 Chapter 1: Get familiar with the French VCE requirements and the resources available to you. What will be expected from you? Get into an examiner’s mind and learn where to find the resources and how to best shape your exam answers to fit the brief! Chapter 2: Reinforce your French grammar and vocabulary. Tips and checklists to help you plan your revisions and a section about how to use your dictionary (includes a practice worksheet). Chapter 3: Practice for each of the exam components. Tips and exercises. Because nothing beats practice! • a list of resources to go the extra mile. I hope this guide will be helpful to you. I am happy to share my experience and observations of the high school students I have tutored so you can benefit from it, gain confidence and achieve your best possible score for the exam! I’ve created many resources to help you prepare for your French VCE. I can also help correct and improve your essays. Submit your French essay to me for feedback and correction!